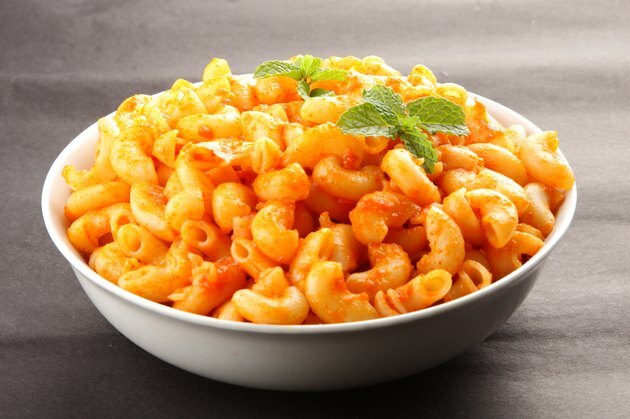 Pasta is an enjoyable finger food for babies. Wiggly strands of spaghetti or linguine keep the baby's attention on food for longer periods because she can play with the strands as well as eat them, while larger pasta pieces like rotini or shells give her an unusual texture to savor. To prepare pasta for your baby, you must cook it until it is soft and cut it into small enough pieces for a tiny mouth to handle. For maximum safety, wait until your child is at least 9 months old to ensure he is ready for finger foods. Bring a small pot of cold water to a boil. Do not add salt to the water even if you typically salt your pasta. Add no more than 4 ounces of pasta per quart of water to the pot. If you add too much pasta, it will stick together, and you may end up with undercooked sections. Boil the pasta for the amount of time specified by the package, then remove a piece to test for tenderness. If you can easily mash the pasta to a paste between your tongue and the roof of your mouth, it is tender enough for your baby to gum. If not, continue to boil the remaining pasta, checking for tenderness every few minutes. Drain the pasta and allow it to cool. Break or cut it into bite-sized pieces with your fingers or a knife before serving it to your baby. To make the pasta more flavorful for an older baby, toss it in a small amount of olive oil with a pinch of oregano or basil. Although pasta is safe for most babies after 9 months, do not serve wheat-based pasta to a baby younger than one year if you have a family history of wheat allergies or gluten intolerance. Wait until the child is old enough or serve a rice-based pasta instead.